That little moppet is Mara Wilson, the once and former Matilda Wormwood and Mrs. Doubtfire’s low-key secret weapon. I loved those movies too, but we owned the Miracle On 34th Street remake on VHS, and a Miracle/Muppet Christmas Carol double-feature was always high on my holiday to-do list—a list I was able to tackle in earnest on Thanksgiving day and not a moment sooner. And as such, Mara Wilson became oddly seasonal in my brain, a human tradition who, like nearly all child stars, seemed somehow destined to be time-locked at “He loves you and he wants to kiss you and he thinks you’re the most beautiful woman in the whole world!” years old, forever and ever. That was Mara Wilson, child star. 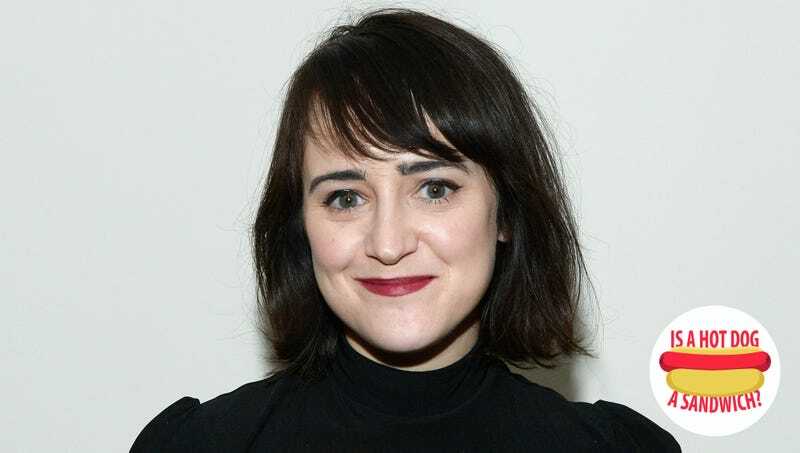 Here’s Mara Wilson, adult human. Mara Wilson was a very good child star, and a very good addition to my childhood Thanksgiving rituals, but she is an even better writer. She wrote, via email, the following answer to a very silly question. The time-locked, childhood version of me cannot handle it. Mara Wilson: I don’t believe a hot dog is a sandwich. TO: Why is it not a sandwich? MW: To me, a sandwich means “One or more foodstuffs between two pieces of some kind of bread.” The two pieces of bread is what makes it a sandwich. A hot dog bun comes in one piece, therefore it is not a sandwich. TO: Do you feel similarly about other sandwich-type foods that don’t include the word sandwich in their names—hoagies, lobster rolls, burgers, etc.? MW: I would consider a burger a sandwich, as it comes between two pieces of a bun, but hoagies and subs trip me up a bit. Perhaps what is important is not that it necessarily comes between two pieces of bread, but that it is able to maintain its structural integrity between two pieces of bread. I’ve had subs where the bread was not cut into two pieces, but I would still consider them sandwiches, because even if the bread came apart, the sub would still manage to hold together. But when a hot dog bun comes apart, the whole thing falls to pieces and becomes a damn mess. Have you ever tried to eat a hot dog with a bun that came apart? I have, because I’m clumsy. You’re lucky if it doesn’t immediately fell to the ground. I don’t eat shellfish and I never really have, so lobster rolls are a complete mystery to me. It’s possible that some lobster rolls are sandwiches, and some are not, depending on how they are made and how they hold together. I’m willing to be flexible here. That said, though, I will hold firm that an ice cream sandwich most definitely is a sandwich, and it is one of the best kinds of sandwiches. Mara Wilson’s Where Am I Now? is available, ah, now, from Penguin Books. Her newsletter, which you can subscribe to here, is a freakin’ joy. Sure, but can you use a hot dog to defeat the Trunchbull?